Photographic evidence of an epic 3 weeks in Bhutan with Gray Langur Tours, through 50 of my favorite photos of Bhutan. Together at the top of a mountain, we watch ominous storm clouds roll in the distance. Biting winds tangle hair as prayer flags slap and clap behind us, but we’re all too distracted by the view to care. A green valley sprawls below us, forests and roads and rice paddies intertwining to weave a lush Bhutanese vista. For the umpteenth time, the beauty of Bhutan overwhelms me. I’ve been in the country for almost three weeks, but every time I look around, it feels like I’m seeing the country for the first time. No matter which direction you look, everything is too surreal, too beautiful. I say as much to Sebastiaan and Gabriel (founder of Gray Langur Tours), my trekking companions atop the mountain. I grin. That’s exactly it. Is Bhutan really so beautiful? Since that moment atop the mountain, I’ve met endless numbers of people deathly curious about Bhutan. I attempt to describe my love for Bhutan and its people, and though my conviction (and/or foaming at the mouth) seems to get my point across, I struggle to verbally do Bhutan justice. Seeing is believing; it’s hard to wrap your mind around the fact that such an idyllic kingdom exists without some photographic evidence. So let’s go on a little visual jaunt of my time in Bhutan… because sometimes words just don’t cut it. Tingtibi, a small town in the Zhemgang district of Southern Bhutan, was my first stop. The town’s temple blew my mind; little did I know that this is nothing compared to what I’d see in the coming weeks! Next destination: Birtii, an off the beaten track village in Bhutan amongst the hills with only 23 houses! I requested Gray Langur choose homestays over hotels for my itinerary, and my wish was granted! We stayed in a homestay in Birtii, and despite not speaking any English, our hostess plied the group full of delicious rice beer, known as singchiang, and some damned tasty (and spicy) stir-fried beef and vegetables, Bhutanese style. … all made with ingredients from her own garden, of course! After Birtii, winding mountain roads took us through village after village of picture perfect houses. Bhutan’s government requires all architecture in the country to use traditional window styles, and the result is a visual treat. … but for the group of young monks playing a heated game of football in Crocs outside the walls! A few hours down the road, Kuengarabten was supposed to be a quick stop en route to another town. But with views like this, I couldn’t bring myself to leave… so we didn’t! Karma, guide and friend extraordinaire, arranged for us to spend the night in his cousin’s house. Good thing he did, otherwise I would’ve missed out on this sunrise view of Kuengarabten Dzong! Trongsa, a “city” of sorts in central Bhutan, was our next stop. The mountainside city wraps around Trongsa Dzong, the longest in the country. Monks’ sandals clapped the stone floors on the monastic side as the formal shoes of administrative officials clicked on the other. After driving away from Trongsa over mountain passes and along cliff sides, we ended up in paradise, AKA Phobjikha Valley. More commonly known as “Gangtey”, Phobjikha Valley is home to Gangtey Monastery, one of the most impressive in the country. First established in the 1600s by Rigdzin Pema Tinley, the monastery is home to more than 100 monks, and is lookin’ mighty fresh these days thanks to a full restoration in the 2000s. Visitors to the monastery—and all other monasteries and dzongs in the country—must dress respectfully. For foreigners, this means covering up bare arms and legs. For Bhutanese men, this means donning a gho and kabney, a traditional robe and scarf like this man. The monastery sits atop a hill overlooking Phobjikha Valley, surrounded by small but pretty Gangtey village. Pleasant as the village was, it was filled with hotels. I’m all about local experiences, so rather than stay in a hotel in Gangtey, Gray Langur opted for one of the “farmhouse” homestays down in the valley. Twenty minutes of bumpy driving into the valley brought us to our farmhouse retreat. The home was cozy despite the cool air, and the greenery of the surrounding vegetable fields and forests was enough to calm even the most hectic of minds (… it sure worked on mine!). … but the adorable amma, grandmother, might have been my favorite! She stood outside to watch us go, praying for our safe travels as I said my goodbyes. During a long drive from Phobjikha Valley to Punakha to Gasa, we joined up with a Gray Langur tour group to begin our journey to the Royal Highlander Festival. Following a night of camping under the stars, we woke up to this view in Gasa, the starting point for our trek. The two-day trek to Laya, Bhutan’s highest settlement at almost 4,000 meters above sea level, was a long and wet slog. Between rain and muddy trails, pack mules hurtling along the narrow paths, and a misunderstanding about distances (a common occurrence in South Asia…), it tested everyone’s patience. … but snow-capped mountains, a lively festival, and nomadic cultures I could never even imagine greeted us in Laya. The festival at the end well justified the (rather soggy) means. Yaks in outfits, the finest livestock this side of the Himalayas, and a royal visit—just another day at the Royal Highlander Festival! Don’t miss this Royal Highlander photo essay for the full-on festival experience. Two days of nomadic display, two days of trekking down the mountains, and the group ended up back in Punakha, home to Bhutan’s largest and most spectacular dzong. The outside was already breathtaking, but I assure you, the interior is even more impressive. 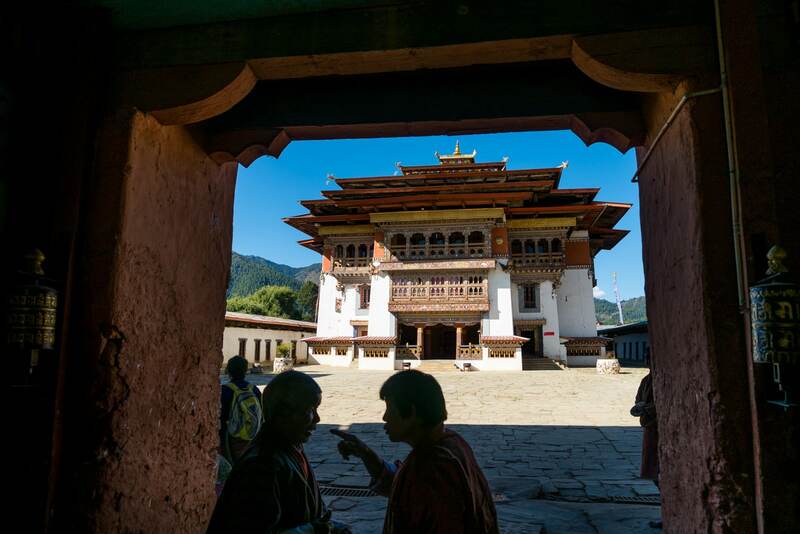 The ornate dzong was once the seat of Bhutan’s government, before the capital shifted to Thimphu in 1955. Like others in the country, the dzong serves as both an administrative building and a monastery. … oh, and a sweet ceremonial hall, of course! The current King Jigme Khesar Namgyel Wangchuck and Queen Jetsun Pema tied the knot here in 2011. Stunner as it is, Punakha’s dzong is not the city’s only draw. On a hill outside of Punakha sits the Khamsum Yulley Namgyal Chorten, which supposedly wards away bad spirits and brings peace to Bhutan and the world. It wasn’t, however, very effective at warding away fog. Fog and mist plagued the trek up, but with a little luck (and a lot of patience), the clouds eventually cleared to reveal the golden valley below. Punakha sightseeing complete, the group headed to Thimphu, Bhutan’s capital. Buddha Point, the city’s most famous sight, was abuzz with people; His Holiness Je Khenpo, one of the most respected monks in Bhutan, was preaching at the foot of the Buddha for several weeks! An immensely colorful crowd in traditional gho and kira gathered to sit and listen to his words. Retail adventures complete, it was time for the Gray Langur tour group to head towards the Paro airport to end their journey… but not before stopping at the Tiger’s Nest Monastery, Bhutan’s most iconic sight. Compared to other sights in Bhutan, the monastery, also known as Paro Taktsang, was busy with tourists. To escape the small crowds, I followed a path diverging from the main drag. Hundreds of fluttering prayer flags framed my view; only the sound of rustling pine needles reached my ears. Though the Tiger’s Nest was the last stop for the Gray Langur group, my tour wasn’t over yet! Sebastiaan, Karma, and I drove out towards the often overlooked Haa Valley, several hours’ driving from Paro. Though Haa was pleasant enough, the scenery en route was the real show stopper. On our way through the mountains, we saw an old couple on the side of the road, hands out in the hopes of hitching a ride. As a fellow hitchhiker, who was I to deny them a ride in our spacious tourist car? I asked the driver to stop and give them a lift. The couple were delighted. As we drove along the road, they told us they were going to their sister’s house to help her harvest chilies. Easier said than done; from the point where we dropped them off, they said they’d trek for four hours to reach their sister’s house. Upon arriving in Haa, we made our way to Lhakhang Karpo and Lhakhang Nagpo, more commonly known as the White and Black Temples. The freshly restored walls of the White Temple greeted our arrival, and the deep vibrations of pounding drums and chanting monks drew us further in. After watching the monks perform their rituals, we piled back into the car, zigzagging up the mountains until we reached the highest point of the day: Chele La pass. At almost 4,000 meters above sea level, freezing gusts of wind stung my cheeks as I climbed to the top… but I was too busy stalking the yaks grazing amongst the thousands of prayer flags to mind. Ominous clouds rolled past as I stood atop Chele La, and I eventually returned to the car rather than be caught in the rain (or snow). Good thing I did; we encountered multiple rainbows as we began our descent down the other side of mountain. Why yes, Bhutan, you really did outdo yourself. After a day of rest in the capital, Sebastiaan, Gray Langur’s founder Gabriel, and I set out on the final leg of the trip: two nights and three days on part of the Druk Path, a trekking trail running between Paro and Thimphu. Though sun shone down on us for most of the day, clouds began to gather as we approached our first camp below Jele Dzong. We knew we should rush down and take shelter in our camp, but we couldn’t resist the spectacle of watching snow blanket the mountains along the horizon. Eventually, the winds picked up, and darkness began to fall; it was time to concede to the elements, and take shelter in the camp. A massive amount of snow and hail fell from the clouds, transforming the grassy hills into a wintry wonderland. The next morning I woke up with the sun, trekking back up to Jele Dzong as the first golden rays of light illuminated the freshly frosted mountain. Alas, within a few hours, the warmth of the day melted the icy coating on the ground (if not the snow on the horizon). Camp packed and ready, we carried along the Druk Path past grassy fields and mossy forests, ending up in a clearing overlooking a valley. Despite below freezing temperatures, I emerged from my toasty sleeping bag an hour before dawn the next morning. I clawed my way up a steep slope of trees, pine needles, and deep snow just in time to catch the sun rising over camp. For the thousandth time, I was lost for words. But all good things must come to an end: several hours’ traipsing down the mountain, and we were back in the car en route to Thimphu for our last day in Bhutan. After freezing in the mountains, I was delighted to have a hot shower and admire the view from the hotel room window… but then I realized that’s no way to spend my last day in the country! I called my guide, Karma, about going to lunch, and what began with lunch evolved into an adventure. During the day, we roamed the capital’s streets; at night we shared beers with another guide, and chilled with Karma’s friends in his Thimphu apartment. A far better ending than a night in at the hotel! With a heavy heart (and a slightly fuzzy mind) I leaned my head out the car window the next morning, watching landscapes roll by on the way to the airport. I didn’t want to leave Bhutan, and I didn’t know when I would next return. As the plane took off, the mountains of Bhutan receding beneath me, only one thing was certain: that I would find my way back somehow, someday. Want to travel to Bhutan? I traveled to Bhutan with Gray Langur Tours, who sponsored the entirety of my three weeks in the country, both off and on the beaten track. In case you didn’t notice, I had a blast, and totally fell in love with the country. I recommend them (and, more importantly, their guides) to anyone interested in visiting Bhutan. Gray Langur offers both set and customized tours; contact them on their website for more details and prices. Still deciding if you want to pay out for Bhutan? Here’s why I think Bhutan is worth your money. These are gorgeous! My husband has been wanting to visit Bhutan for a while and we’ve done some initial planning but this was good motivation to go and figure things out a bit more.